Along with a variety of physical, social and digital experiences, destinations and activities, a successful university building or campus needs its own identity. One important factor for students is still the ‘instagrammable’ campus, but this does not necessarily mean expensive buildings with the highest specifications. What it does mean is places with soul, that are well-designed and that have their own identity. Engaging with the inhabitants is key to creating a future sense of belonging. People use space in different – and sometimes surprising – ways. Small scale improvements and ‘sample areas’ can be a test bed for rapid prototyping, leading to new ideas that are easily realised. This helps us to better understand what works for students, staff and academics and design solutions for them from that learning. Early and ongoing conversations are essential to capture inhabitants’ aspirations. When developing an evolutionary research centre for University of Bath, the department worked closely with us; from the design brief and initial plans, right down to the furniture colours. Instead of designing from theories, we drew from decades of lived experience. The outcome? A building regarded as home. Mixing different groups in a building also helps to create a strong student and academic community. 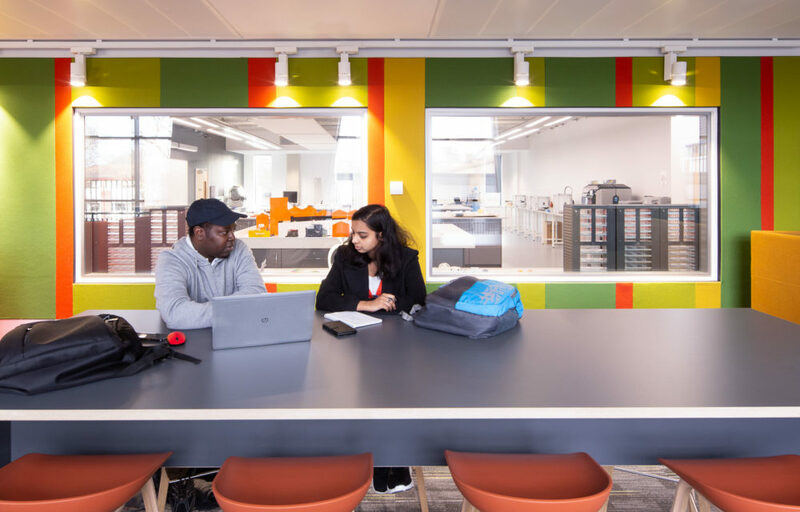 The Beatrice Shilling Building at Royal Holloway University of London is home to the Department of Electronic Engineering, but the 24/7 open-access social spaces are now used and loved by the wider university community. This brought more variety and vibrancy across the department’s threshold, and meant that the department’s innovative work – easily observed from the social spaces through large lab windows – was made available to a much wider, diverse audience. Universities will always have specialist requirements, but we can engineer these spaces to be more efficient. At the Health and Life Sciences Building for University of Reading and the Life Science Building for University of Kent, we promoted a shared asset culture to stakeholders. Not only does this increase space utilisation – which is cost efficient – but it brings people together. The sharing of space leads to sharing of conversations and the cross-fertilisation of ideas and innovation. The success of any place and space we create is best measured by those who use them and how well they are used. Through our inhabitant journey we understand that ownership comes from understanding why spaces are created in the first place. With ownership comes identity. Spaces with soul become homes for learning, teaching and discovering. Cora is attending this year’s AUDE Annual Conference | 15th – 17th April 2019 | Lancaster University. Drop by stand 4 and pick up a copy of our latest Inhabitant magazine. Issue 02 is all about the people who inhabit our university buildings.